Simply put, if you're looking for a versatile communication solution that doubles as a Bluetooth headset for your mobile device as well as a subtle headset for PC-based communications you'll be extremely pleased with the Jabra Supreme UC. High quality wired and wireless headsets for mobile phones have become ubiquitous. With technology like Beats Audio becoming mainstream, mobile phone users have grown to expect a different level of quality from their mobile headsets. Of course, this is mostly in response to people dashing their stand-alone MP3 players for smartphones that do double duty as mobile communication devices as well as mobile media players. But what about folks who prefer the classic on-ear Bluetooth headset? That's where the Jabra Supreme UC Bluetooth headset comes into play. While we prefer stereo Bluetooth headsets like the Plantronics BackBeat Go for music while commuting or working out, the Jabra Supreme UC is actually a much better headset for straight-up communications. With the ability to pair with up to two devices simultaneously, the Jabra Supreme UC is designed to work with mobile devices like mobile phones and tablets as well as PCs. At first glance this may sound strange, but the Jabra Supreme UC is designed for a world where folks typically communicate via mobile phone as well as PC-based apps like Google+ Hangouts and Skype. In fact, the Jabra Supreme UC works with most Unified Communications (UC) applications including those by Microsoft and Cisco. 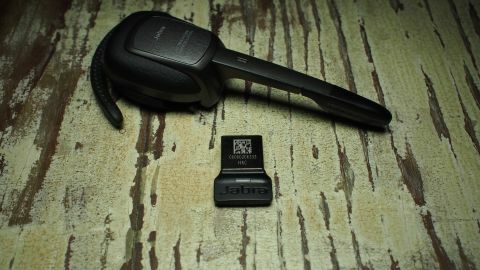 In our tests we connected the Jabra Supreme UC to an HP Envy Spectre laptop, as well as an HTC Radar 4G and an iPhone 4S. When at your workstation, you simply pair the Jabra Supreme UC with your Bluetooth-enabled PC and your mobile device. If your PC lacks Bluetooth support the Jabra Supreme UC ships with a Jabra LINK 360 Bluetooth USB adapter. Switching between sources was as simple as holding the "answer call" / "end call" button for two seconds. After that you'll hear a beep that indicates that you have switched sources. It sounds super simple and in our tests it actually was. Additionally, in our tests we seamlessly switched between Skype, to a mobile call, and then to a Google + Hangout. The Jabra Supreme UC charges via the same micro-USB plug that charges pretty much every device in the world that isn't made by Apple. And Jabra made sure that you'll always be able to charge this thing as it ships with the requisite micro-USB cable, a car charger, and a wall charger. It also ships with a carrying case. Jabra claims that you'll get about six hours of talk time from the Jabra Supreme UC and about 15 days of standby time. Since we didn't use the Jabra Supreme UC for music, what with it not being stereo, we actually did experience similar talk and standby times. Of course, you can stream music to it, you just can't control the media player functions with the headset. For what it's worth, the Jabra Supreme UC isn't really made for that. This is a serious, no-nonsense headset. To that end it did a great job of picking up our voices. We tested it while driving to and from work and the collapsible boom mic did a bang up job. We also tested the Jabra Supreme UC while walking around outside of the Future US offices in windy South San Francisco, and while the wind has proven to be a problem with other headsets, the device's active noise cancellation did a great job of making sure that our voices broke through the gale force winds. The Jabra Supreme UC is designed to be worn on either ear and the faux leather ear pad is nice and comfortable. That said, it doesn't feel quite as stable as in-ear headsets. This thing is designed to be used when stationary. One area where the Jabra Supreme UC really shines is with its voice guidance technology. Simply put, anything that you can think of you can do with voice commands. Boasting A2DP technology, the headset uses voice commands for everything from caller ID to GPS announcements. When you flip the boom mic open the headset announces "power on." This is a nice feature, especially when driving. When you close it you're told "power off."